Here’s a clip of bi-coastally based power pop indie outfit Wildlife Control, aka a pair of brothers, Neil and Samul Shah. 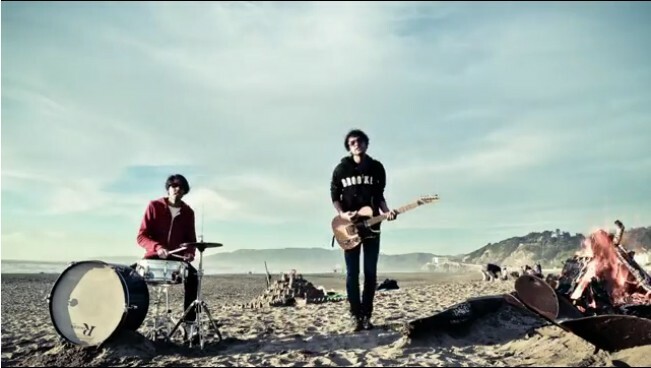 It’s the video for their 2011 single “Analogue or Digital”, the lead track from the band’s recent 4-song EP Spin. The syblings-turned- bandmates live on opposite coasts of the United States; one in Brooklyn and the other in San Francisco, respectively. This video was created by the brothers in February of 2012, using a full day of stop-motion, time-lasped filming at San Francisco’s Ocean Beach. What you’re seeing is one continuous, day-long take from sunrise to sunset. Physical distance doesn’t seem to be much of a barrier to Wildlife Control.The band’s music, and all of the supporting work behind it is the product of a technologically forward-thinking process on the part of the brothers, free of a record company, and writing the tracks and recording them with the help of mobile technology, the Internet, and the odd airplane ticket. The songs on the EP were also recorded in remote locations besides studios, including bedrooms, stairwells, and parks. In the 21st century where mobile technology and the Internet enable music to be made across insulated wires, mobile device towers, and satellite technology, the brothers are taking full advantage of the tools available to them, and drawing from their own enthusiasm of technology, collaboration, and community. Anything seems to go in terms of their approach, whether analogue or digital; they weren’t kidding around with that title. Live playing, samples, and synthesized textures all live together in harmony here. But, despite being up on the tech-geekery, the brothers still know how to put together pop/rock music that gets you dancing, and gets you singing the melodies to yourself in your head after the song’s over. Besides the creation of the video, the Shahs work on every aspect of production and support of their work as a team, supplementing that with welcome interaction from a community of fans. Speaking of which, you can catch up with Wildlife Control on Facebook. You can also send a tweet to Wildlife Control on Twitter.